Allen Lambert worked as a gamekeeper on the Stody estate in north Norfolk. On 1 October 2014, he appeared at Norwich Magistrates' Court and was found guilty of two charges relating to the killing of 10 Buzzards and a Sparrowhawk on the estate, and possession of pesticides and other items capable of being used to prepare poison baits. A key part of the case for the defence was the idea that the number of dead Buzzards found was too high to have been achieved through illegal poisoning in one area and that the carcasses must therefore have been 'planted' on Mr Lambert. When the experts were consulted, however, BTO quickly provided the robust evidence that refutes this claim. Counts of Buzzards in north Norfolk from the same time period as the crimes took place (March–April) were extracted from BirdTrack and mapped (see map). These counts were logged by birdwatchers like you, during their day-to-day birding. Who could have foreseen that the simple action of recording sightings in BirdTrack would realise the immense value of such 'normal' observations in this way? As well as proving beyond doubt that double-figure counts of Buzzards are a regular occurrence in Norfolk these days, data collected by BTO volunteers was used in court to highlight the recent population increase and range expansion of Buzzard. 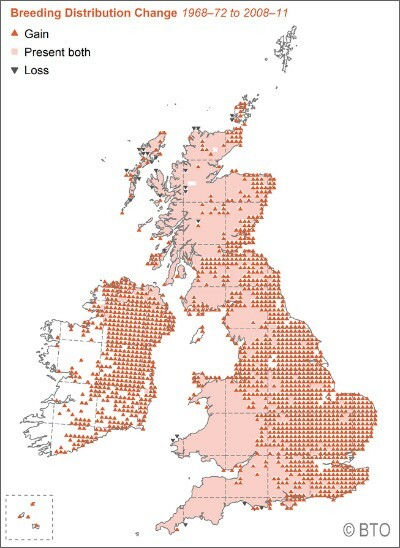 Data from Bird Atlas 2007–11 and the Norfolk Bird Atlas were used to show the eastward spread and increasing population density since the previous breeding atlas in 1988–91, while CBC/BBS data spanning 5 decades helped emphasise the recent, dramatic population increase. 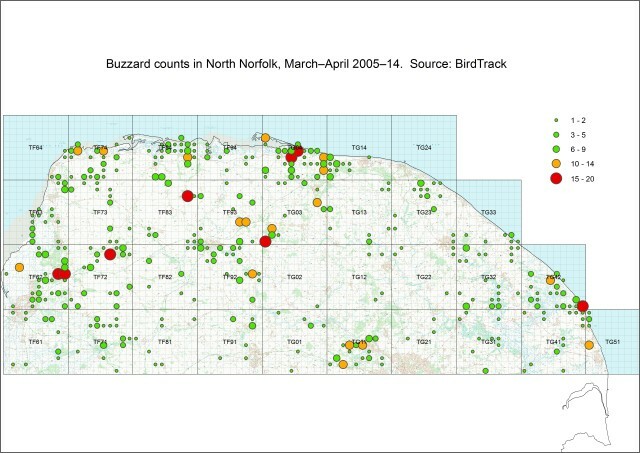 Graphic of BirdTrack counts of Common Buzzard in Norfolk. This was used as evidence in the Allen Lambert case; note the presence of several counts of 15-20 birds which consequently refuted his claim that so many Buzzards could not have been killed in one place and that they had been planted upon him (Source: BirdTrack/BTO). It's not unusual for BTO data, provided impartially, to find valuable applications like this. Power to you!